This convenient mobile desk includes four drawers and a waste water container. The self-contained center includes front-sliding doors and a lock. The cabinet provides space for larger equipment and water bottles. The work surface is made of ChemGuard. 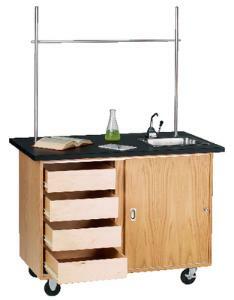 Ordering information: This table provides four drawers, a water supply with a hand pump, a waste water container, two 3/4 upright support rods, a crossbar rod with clamps, a GFI duplex electrical outlet, and a 25" extension cord.